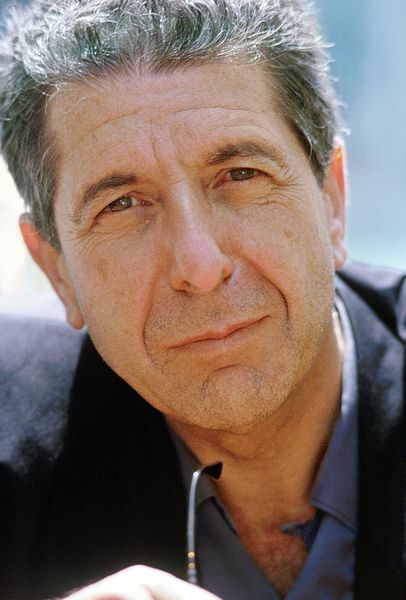 Today, we belatedly pay tribute to influential Canadian singer, songwriter, poet and novelist, Leonard Cohen, who died earlier this month. As usual, our contest will begin with three things. This week: single title , album title and genre. Incorporate the single title AND the album title – literally or symbolically – somewhere in your story. We spun, and our three elements are single title: Show Me The Place, album title: Death of a Ladies’ Man, and genre: Crime. Judging this week is Microcosms 45 Judge’s Pick, Alva Holland. There was a shuffling behind him and he turned. Spiky stood there. “Uh, the suspects are ready for you,” he said, pointing to a dark corner where two girls sat. He approached them and saw Marianne and Suzanne who were high school girls in the same class as his daughter. He blanched as it dawned on him why they were here. It turns out “Two-time” was a pretty good nick-name for Lenny. He spoke quietly to them, assuring them that everything would be okay, and then he left. He checked with the manager of the club and saw that the surveillance cameras were not working. Good. No proof that the girls were involved. Lenny was a dead ladies’ man now. Dead men don’t talk. Hallelujah! A popular problem of time travel is that you never get to go back to the same place. Joan of Arc who by fire, was consumed in her first life, was part of a group due to go to earth this week. The “tour guide” had droned on and on about the stories of the street that they would get to hear, and she had begun to slip into a daydream. “First we take Manhattan,” the tour guide said, bringing Joan back from her reverie. New York! She had always wanted to go there. This would be fun. They were ushered to the time machine and, twittering amongst themselves, they got in. Joan’s friends, Suzanne and Marianne teased her about wearing her “famous” blue raincoat. She had gotten it in London on one of her trips, and she wore it every time she traveled. She was a winter lady anyway and felt the cold easier than most. Jane sighed wistfully, then said “I missed you since the place got wrecked…” I looked around the former crime scene. The interior of ‘Bar Volatile’ resembled an outlaw Biker rally at closing time. “When…and who?” I asked. “Last Monday night, some dame failed to be charmed by that fat pimp, Lucky Larry.” I suppressed a laugh. ‘Lucky Larry’ was anything but, especially when it came to dames. He attracted head-cases like dead meat attracts flies. DS Paul McCarthy walked past the office of DI John Leonard singing loudly. Leonard shouted at him to stop. McCarthy looked at his shoes, contritely. “Apparently he also did some charity work for an organisation in Frintongar called The Fumble Trust, set up to help retired, inept goalkeepers and their families,” added McCarthy. “Well, we’d best start interviewing these seven suspects. In your experience, does any one of them stand out as most likely? As obvious as a fish on a bicycle?” asked Leonard. Thanks, Geoff and apologies once again. I Would Have Stayed Longer but I’d Already Departed. And If I’d Been a Little Stronger, I Wouldn’t Have Been So Broken-Hearted. Some nights, the darkness creeps in like a murky fog. I sit in the shadows of the Troubadour Tavern, way back in the corner where the dust balls fornicate. The smoke from the snuffed-out candle twirls up into the bleak light of the bare bulb. It hangs from a frayed cord, threatening a sharp, snake-like bite of electrical élan, a flash of pity, a skid of sorrow. It is a soothing refrain, if only because it is familiar, repetitive, expected, undeniable. Through the miasma of memory that drapes over me like a shadow box, I remember, with a clarity that only a sober man can know, how I once was. I listened to my women. As they narrowed in on me with their curvaceous turn of phrase, their soft ascent to a sweeter moment, I recall that I was their man. But somewhere, on some twist in the road, on some icy stretch of highway, I slipped off into a ravine. I clung to the damp grass of my inevitable slide, a lover gone to seed, a roué past due. I now know that the death of a ladies man is not a pleasing sight. It is a slow lingering decay, a composting of lost loves, lovers piled high on the fallen leaves of a discontented autumn. Each night I crawl out of the Troubadour Tavern and wend my lowly carcass back to the two-story walk-up of my fate. The moon, every so often, speaks their names and I cry awake until dawn. The last time I saw Terrance was at the Saint-Augustine resort. We’d been cut off by an avalanche although nobody seemed to mind too much; there was food and plenty of schnapps and, in those innocent days between the invention of the pill and the onslaught from AIDS, the ceaseless merry-go-round of affairs and bed-swapping was probably more entertaining than skiing. Terrance was in his element. He flirted with the nubile blondes always present at that kind of resort. He rose from his chair to take my hand and kiss the back of it. He made some suggestion about joining him later, as if the past fifteen years had been nothing more than a click of his fingers. I laughed. I couldn’t help myself. But those fifteen years had passed. Terrance’s eyes were filmed with yellow, and the expensive suits that had always fitted him so well now hung loose over his body. He coughed and dabbed a handkerchief against his lips. “You don’t have regrets?” he asked. I remember that. I remember that perfectly. He died in the night. There was a fuss as they tried to decide where to store the body until the road was cleared. He would have liked that, I think, being the centre of attention, sending the unflappable resort manager into a fluster. One of the maids came and told me what had happened. I didn’t know what to feel. I would blame the schnapps for the numbness, but I still don’t know what to feel. I went outside on the balcony where it was too cold to feel anything at all. The snow from the avalanche lay perfect and smooth over the slopes, and the ice crystals glittered in the sunlight. The damage lay underneath. Maxx tried to act inconspicuous as he stepped in through the quarantine facility inside the space station. He pretended to greet the futuristic-looking robots guarding the halls before carefully slipping into the room he knew she was in. “Maxx!” She gave an excited squeal at the sight of him, making him place a finger on his lips. She shrugged. “Okay, I guess. I can’t remember what I’m called though,” she said in a hushed voice. “Why are you whispering?” she asked. “Because we have to keep quiet,” he answered. He frowned. “Can you show me the place?” he asked, softly, dreading what he might see. “Sure.” She lifted her long shiny tresses of hair away and tilted her head forward to allow him a look. He moved his head one way and then the other, looking at her from various positions. The black patch on her scalp looked a lot like what he had learned in his criminology class—a memory chip. So, he thought. Her memories aren’t completely lost. They had simply been extracted through that chip. “9033,” he started, but she made a tutting noise, making him stop. “But you don’t remember your name,” he tried to reason. He let out a soft sigh at the sight of her smile. So pure and innocent. “Show me the place,” ordered Tyra. Corporal Taylor keyed in the access code and led Lieutenant Tyra McDonald down to the cargo hold. “Not to mention the vital organs,” said Tyra moving across the cordoned-off area to examine the heart, lungs and kidneys placed in various positions around the hold. “The death of Lynden Berman is, of course, a tragedy,” murmured Tyra, forcing her face into a suitable mask of sorrow, as the Captain appeared at her side. Tyra nodded. It was her own husband, Brandon, who’d swapped with Berman. It could have been him. She recalled their last dinner at the CEO’s. The two men had gone off to watch an alter-reality show, leaving her and Valeria alone to chat about life, the universe and everything, including their disappointing partners. When they’d left, the two women had come to an agreement of their own. One part of which had now been carried out … according to Valeria’s instructions. She briefly wondered about Brandon and then dismissed him from her thoughts. CEO Berman was an extremely efficient woman. The small girl with the haunted eyes dutifully started pointing. I tried to stay calm. Should’ve asked where he didn’t touch her. She nodded, and was once again enveloped by the waiting paramedics, glints of anger seeping through their steely-eyed professionalism. The mother paced around the living room, restless and edgy. Like a caged tiger. Wild eyes locked on mine. Her pacing continued, her bloodied hands impulsively balling into fists and then releasing themselves again. She roared and bolted for the bedroom, where the mutilated corpse still lay where it had fallen. Officers scrambled to restrain her from beating the dead man into even more of a pulp, but her white-hot rage was almost insurmountable. I turned away from the carnage and headed back to the door. My junior met me there. I glanced back at the chaos inside and then to the shell-shocked child in the ambulance. Her ripped dress and bruising made it hard for me to sympathise with the victim. I’m old and almost spent, which is good as the doc just said it’s closing time. Time to get a few more in before last orders, but he advised to buy shots. Funny, but I thought I’d go out and do the things I kept putting off. Instead, I went home, sat in the wooden chair at the kitchen table, nursed a scotch and stared at thirty years ago. I died back then. Sat in a chair much like this one…can still feel the wood biting into my back, the heady heat of a summer trying to crush us down. The smell of coffee was strong in the air, the scratchy feel of smoke in the eyes and throat, and the rattling hum of an impotent electric fan dully spinning round. She was standing, her hands flat against the worktop, her back bent, curved against my neglect and…foolish wandering. I was sure she’d let it slide…she always had. A few apologies, a few assurances…another round of promises and she’d be good. Never thought she had a limit. But when she turned, no gentler eyes have ever killed: gutted me, emptied me. And she stood there like Nemesis made flesh, each wound in her eyes or announced on her twitching lips. She straightened up like righteous wrath, and she cupped my face in unflinching hands. Her lips were warm and soft against my own as she passed down her sentence in a kiss, and when she looked at me, I knew. No execution was so sublime as she stole my breath, drawing out the hallelujahs I never knew I had. And in the aftermath, in her hold, with the taste of her and her name on my lips, I came alive. The year my father made cousin Quintonella cry was the last time we had relatives for Thanksgiving dinner. Even as an uncultured eight year old, I knew my father was someone best swept under the rug. Wednesday evening, everyone piled into the Buick stationwagon – adults in the real seats, kids writhing in the back like the snake scene from Raiders of the Lost Ark. We went from paved roads, to dirt roads, to a rutted driveway. We piled out at a farm near Mount Solon. “Show me the place where delicious birds live,” Dad hollered. I hid behind the turkey houses. Dad and the farmer picked out the avian victim, and Dad, as he did each Thanksgiving Eve, challenged the bird to a life or death wrestling match. Winner feasts on the loser for Thanksgiving dinner. I never thought the turkeys had more than a kernel of understanding about why they were wrestling. The dull glint in their eyes brightened after human contact, but faded to panic after realizing arms trump wings as a weapon of war. On the ride home, Aunt Mildred and the cousins were as pale as ghosts. Our dinner guests were afforded a privilege the rest of the family never received: the choice of white meat, dark meat, or squid. Dad packed a cephalopod inside the bird before roasting. Way better for flavor than bread and celery, he’d explain every year. When cousin Quintonella mentioned that her slice of turkey thigh had more white bits than the dark bits she’d asked for, Dad snapped. “You want it darker!” The squid’s ink sac splattered onto her plate. The slamming door sealed our future as the family that gives thanks alone. Which, except for Dad’s incorporating a thrown ink sac into every future Thanksgiving, was fine with me. “If I tell you, it voids my contract with the union, and I’ll never get work again.” She wiped her nose on a sequined sleeve that matched her skin-tight leotard. Brigham tucked his pencil behind his ear, and approached the dresser where, until half an hour ago, a man’s dead body had been lying out of. A dull sword still impaled in his stomach. She nodded. He continued, “You know you weren’t the only one, right?” She blinked indifferently. He’d seen that look on her face enough to know his instincts were still strong. She nodded again. Brigham had seen many a death of a ladies’ man before. But never one that played out in front of a sold out theater. Show Me The Place, Death of a Ladies’ Man, Crime. Brady, I amended “skin tight” to “skin-tight”, since it is a compound adjective. Reducing the word count 299. This meant that, inside of “many a death of lady’s man”, you could have “many a death of a ladies’ man” as required by the prompt.